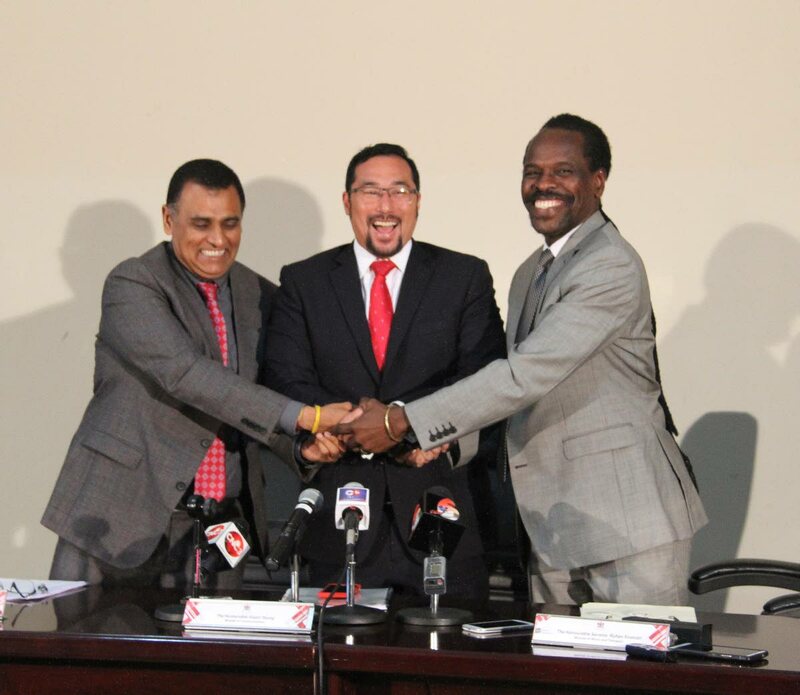 Works and Transport Minister Rohan Sinanan, National Security Minister Stuart Young and Ag Attorney General Fitzgerald Hinds join hands after a press conference yesterday at the Works and Transport ministry in Port of Spain. THE State played no role in the electronic recording of someone sounding like People’s National Movement (PNM) member Harry Ragoonanan allegedly talking about corruption in the procurement of buses for the Public Transport Service Corporation (PTSC). National Security Minister Stuart Young said so at a news conference at the Works and Transport ministry in Port of Spain yesterday. He said it was “astounding” that against this background, Ragoonanan joined former minister Devant Maharaj and attorney Nyree Alfonso on Sunday to make several corruption allegations regarding the Galleons Passage and Government’s efforts to procure two naval vessels from Australia for the Coast Guard. Young said it was the Prime Minister and not Ragoonanan, who initiated investigations into alleged corruption at the Port Authority. As a result, Young said a forensic probe was undertaken and two people were subsequently terminated at the Authority. Acting Attorney General Fitzgerald Hinds said the recording “raised serious issues for us in the PNM.” He said the allegations against Ragoonanan were referred to the party’s investigations committee. Hinds said Ragoonanan refused to attend two meetings of the committee and sent a lawyer to the third. Saying Ragoonanan had his opportunity to reply in accordance with the rules of natural justice, Hinds said the PNM’s disciplinary committee will meet next Thursday to discuss the report on Ragoonanan, submitted by the investigations committee. “This matter, if it yields information that should engage the attention of other agencies in TT, it most certainly will.” Ragoonanan was suspended from the PNM as a result of these allegations. Hinds also said in “a matter of weeks” legal action will be taken against Alfonso regarding her role in the procurement of the SuperFast Galicia under the former People’s Partnership government. He said Ragoonanan, Maharaj and Alfonso are not maritime experts. Young said Government already has Intercontinental Shipping, agents for the Galicia, in court. Works and Transport Minister Rohan Sinanan said questions about Alfonso’s role in the Galicia’s procurement were vented in hearings of the Parliament Land and Physical Infrastructure joint select committee earlier this year. Young also rejected allegations of racial or religious hatred at the PNM’s sports and family day in Edinburgh 500 on Sunday, in relation to an alleged video of a woman wearing a yellow sari. Reply to "Young: State not involved"